Specialist insurance cover for the care home industry from Towergate Patrick, a company with over 25 years of experience in the industry. Get a quote today. 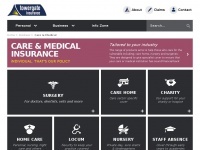 The web server used by Carehome-insurance.co.uk is run by HotChilli Internet and located in Great Britain. On this web server 19 other websites are hosted. The language of those websites is mostly english. The websites of Carehome-insurance.co.uk are served by a Apache web server using the operating system Debian (Linux). The software used to serve the webpages was created by using the programming language PHP. The website uses the latest markup standard HTML 5. The website does not specify details about the inclusion of its content in search engines. For this reason the content will be included by search engines.